One of the universal challenges encountered by organizations that wish to provide quality education is that children cannot learn on an empty stomach. Hence providing meals to students becomes part of the educational mandate. Nepal, like other countries of the world, presents yet another challenge to the educators. 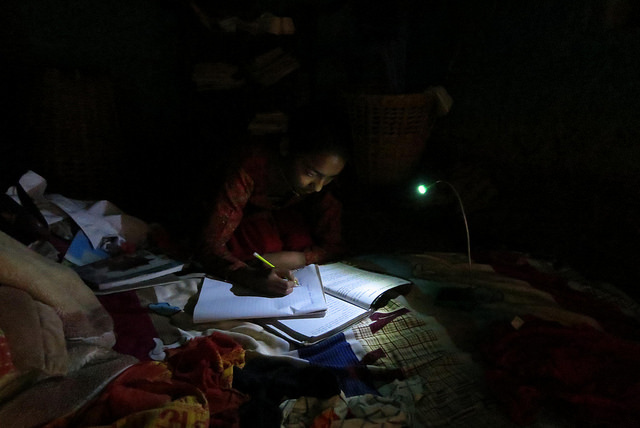 Large parts of rural Nepal are not connected to electric grid and by the time the students complete after school household family chores, the sun has already set. 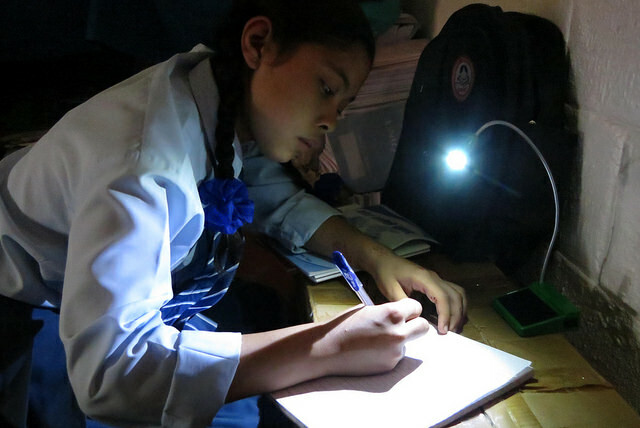 The students now attempt to do their homework or study with the aid of a small candle or a kerosene lamp which barely provide proper lighting. Besides being a fire hazard, the children breathe in toxic smoke and soot produced by the lamps. It is not uncommon to see the interior walls of a typical Nepalese home stained pitch black from soot. Recent diplomatic tension with neighboring India has made the supply of fuel and other necessities scarce and unreliable. Many rural homes that do have access to the electric grid are affected by limited and unreliable electrical infrastructure. This results in erratic and frequent power rationing called ‘load shedding’ creating power outage for several hours a day. It is a big challenge for students to study under these circumstances. 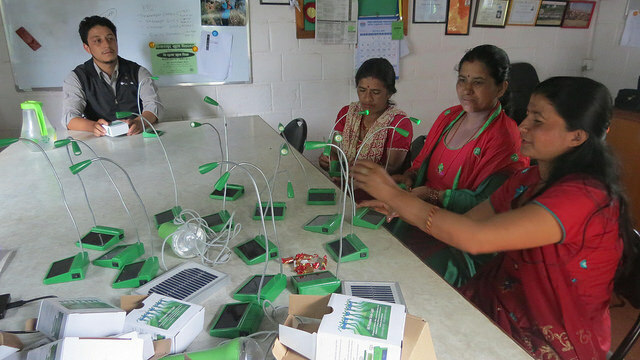 Sumar Lakhani Foundation in collaboration with the Rukmini Foundation and Unite to Light have launched a new project that aims to provide reliable, safe and renewable source of lighting in Pharping, Nepal. Unite to Light has designed a solar powered lamp that charges a battery during the day. 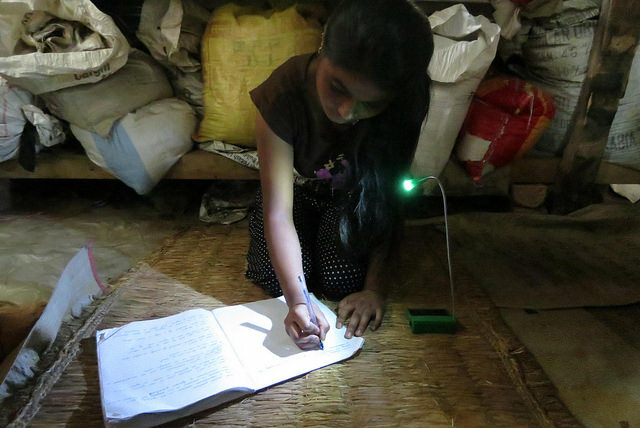 This lamp can provide many hours of lighting for the students to do their homework or just read. The lamps have AA rechargeable batteries that last for several years and can be field replaced. A much larger lamp with as many as 9 highly efficient LED bulbs has also been introduced. This can be permanently mounted on the roof of a home. This lamp is bright enough to illuminate the whole family room for many hours each night. A family can enjoy quality time after sunset. In the interest of financial sustainability of this project, each recipient is asked to purchase the lamp at cost and pay for it over many months from the savings in the price of candles or kerosene. 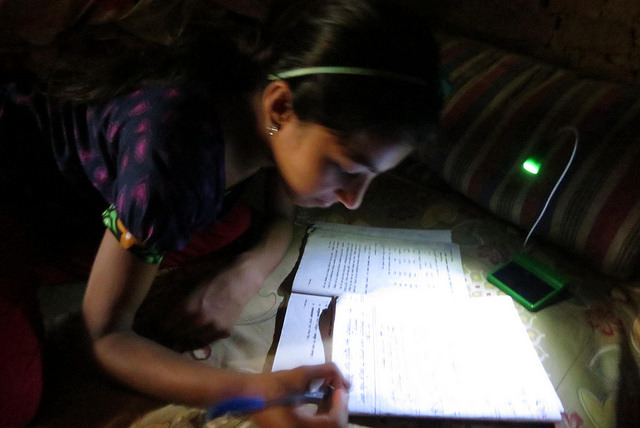 With widespread availability of the solar lamps, students can count on being able to do their homework and read after sunset. This recovery of so many hours which essentially would have been lost during nighttime is expected to result in improved level of education in rural Nepal. A secondary impact will be their quality of health since they will not be exposed to toxic smoke and harmful soot from candles or kerosene lamps. The larger solar lamps will provide an opportunity for the whole family to spend quality time together. Under this financially sustainable model each family will purchase the solar lamp, which is expected to last a decade or more, and pay for it over only a few months directly from the savings from the cost of buying candles or kerosene fuel.